Experimental Plane Sets Off On Final Leg Of Its Round-The-World Journey : The Two-Way It's the first time for a solar-powered plane to circumnavigate the globe. Now it's en route to Abu Dhabi, United Arab Emirates — and you can watch the journey in a live video from the cockpit. 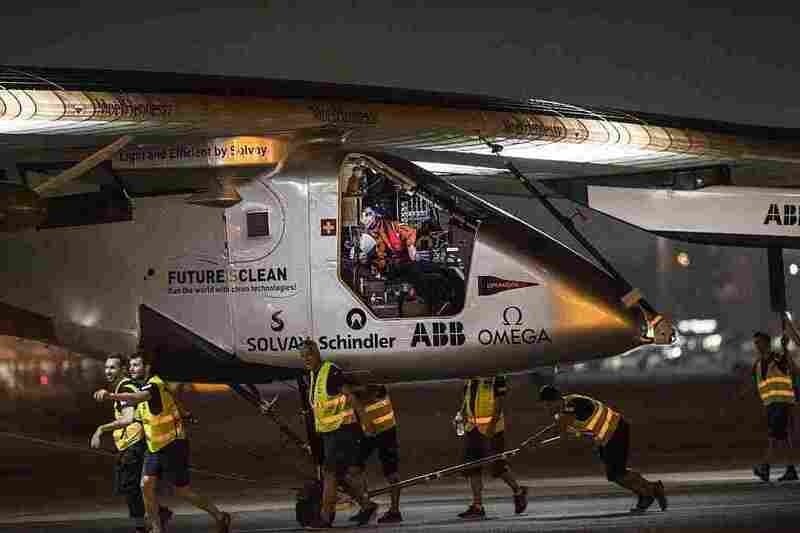 The Solar-powered Solar Impulse 2 aircraft prepares to take off from the Cairo International Airport in the Egyptian capital on Sunday as it heads to Abu Dhabi on the final leg of its world tour. Solar Impulse 2 is about to complete the first round-the-world flight by a plane powered only by the sun. It took off from Cairo on Sunday and is now en route to Abu Dhabi, United Arab Emirates, where the journey began. The experimental plane's team calls this the most complex flight they've has encountered yet. "Crossing the Middle East is not as easy as you may imagine," they say. Factors like "no-fly zones, heat, thermals, takeoff and landing conditions, and wind" all complicate the situation. Pilot Bertrand Piccard, who has rotated legs with his co-pilot, Andre Borschberg, has faced unexpected turbulence in the initial portions of the flight. He's now flying over the desert in Saudi Arabia. "We are moved by this flight," the team said in a statement. "A continuous criss-cross between thrill and sadness, we are finding it difficult to balance our emotions to prepare for our final landing with [Solar Impulse 2] on this round-the-world tour." The team is aiming to raise awareness about clean energy. Before takeoff, Piccard's wife, Michèle, gave a speech praising her husband's sense of adventure. "I look forward to seeing, upon landing, your explorer's smile filled with joy and your eyes sparkling from this experience that you take back to us." She added: "As Victor Hugo once said, 'nothing is more powerful than an idea whose time has come.' "
As we've reported, "Solar Impulse 2 has the wingspan of a jetliner and the weight of a minivan. It uses 17,000 solar cells to generate power — some of which is stored in lithium-ion batteries that help the plane stay aloft overnight." We'll keep you updated on the remainder of the milestone journey.